Lollapalooza might be known for bringing hordes of young people outdoors to celebrate summer in Chicago, but June’s Teens in the Park Fest (TIP Fest) gave it a run for its money. TIP Fest was one part free concert, one part open house for Chicago’s array of summer youth programs. “It was a fun event to get teens out to make them aware of everything different organizations around the city were offering during the summer, whether that be just drop-in programming like the library has or intensive types of programming or internships,” said Julie Koslowsky of the Chicago Public Library. Organizations set up information booths around the festival grounds, on the city’s Northerly Island, interspersed among food trucks and live music. TIP Fest was a joint effort of Chicago City of Learning, the Chicago Park District (which always hosts a summer kick-off event), and YOUmedia. The latter is a digital space for teens at the Harold Washington Library Center where they can drop in to experiment with digital tools, making, and creative collaboration. The space was created in 2009 with the Digital Youth Network and support from the John D. and Catherine T. MacArthur Foundation, and has since expanded to other Chicago library branches and, through a partnership with the Institute for Museum and Library Services, to libraries around the country. The idea is to provide mentors to teens and help them become not just consumers of media, but creators as well. The space offers, for example, a state-of-the-art sound studio where teens can record their music, workshops on graphic design, and laptops and video equipment available for checkout in addition to the usual books and music. In 2015 alone, Chicago’s 12 YOUmedia library locations have received over 24,000 visits. YOUmedia was tapped to bring teens to TIP Fest and engage them in summer opportunities. Part of the job was made easy thanks to Chance the Rapper and Malcolm London. The popular Chicago-based performers are YOUmedia alumni. Between national tours and TED Talks, they have remained heavily involved with the program. After a deeply beloved YOUmedia staff member—performer, poet, and activist Brother Mike Hawkins—died last year, Chance and Malcolm, two of his many mentees, hosted an “open mike” in his honor, which became a popular series. The YOUmedia graduates also curated and performed at TIP Fest, drawing thousands of young fans and securing a surprise performance by rapper Kendrick Lamar. Chance and Malcolm might be the most high-profile alumni to give back to the YOUmedia community, but they are hardly the only ones. “Alumni are still excited about their experience, and they want to come back and see the program grow and work with the students,” said Jennifer Steele, YOUmedia coordinator. Some alumni return as interns, and the staff is piloting a more formal program to place alums in leadership roles. So what is it about YOUmedia that encourages young people who have aged out of the program to come back? Mostly the special community, said Koslowsky, one of the program’s coordinators. The space provides a supportive environment for teens who might not thrive in a school setting. They are encouraged to pursue their interests, developing skills like 3D printing, storytelling, video editing, and performance that can become career or educational paths. “At the end of the day it’s about empowerment,” said Steele. A poet, she has worked at YOUmedia since its conception, watching as many classes come to embody the values of community and self-advocacy. YOUmedia alumni say they build strong bonds in the space. Of course, celebrity endorsements don’t hurt when it comes to putting YOUmedia on the map or inspiring alumni to stay engaged. 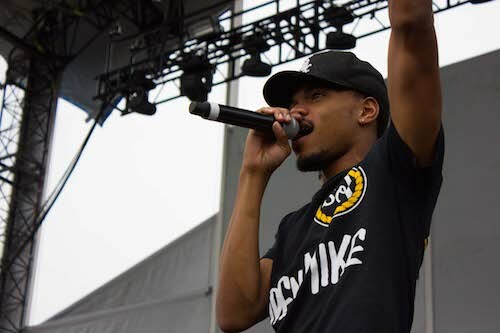 After Chance announced he would be performing at the free show, 9,000-plus TIP Fest tickets were snatched up within 48 hours. Many Chance followers traveled from out of state to attend. What resulted was “crazy chaotic mayhem,” in the best way possible, said Park District Director of Marketing Michelle Geddes. Northerly Island was thronged with screaming fans. And before the show started, they perused the offerings from the Park District, the library, and a huge variety of community organizations—all dedicated to keeping teenagers engaged during the summer. Plans are in the works for TIP Fest number two.